As we’ve previously reported, settling on one size for yourself while shopping is nearly impossible due to retail’s preference for vanity sizing. But it’s not just the numbers (am I a size 2 or a size 6?) that stump us—we’re also thrown by delineations like “petite” and “tall.” Stores like Topshop, J.Crew, and ASOS offer particularly enticing pieces for these special sets, but we never know how to gauge whether one of them applies to us or we’re just a “regular” in-between. To remedy this dilemma once and for all, we looked into the specifics and are sharing our findings with you! 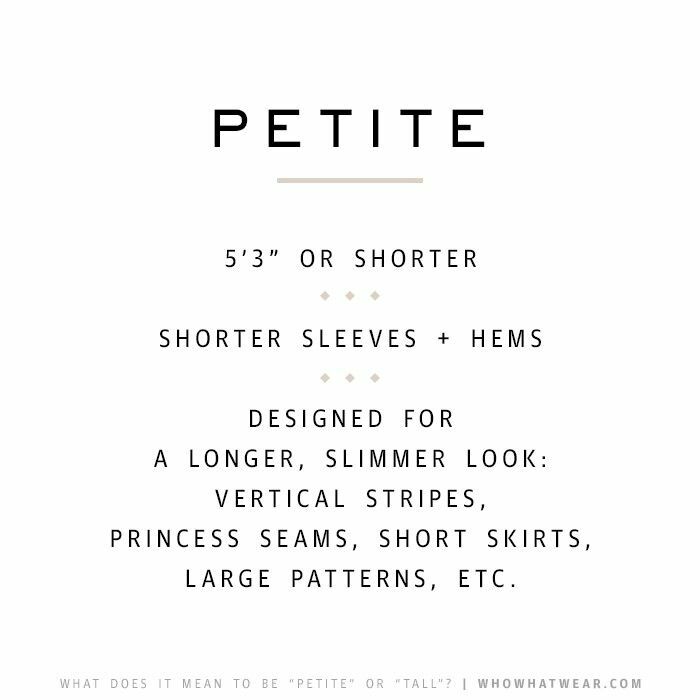 Petite clothing is designed to elongate the limbs and avoid drowning smaller proportions in excess fabric. Vertical stitching and prints are common, as are shorter sleeves and hems. Those who fit into the regular pool have a plethora of shopping choices, though it’s safe to say that someone who is 5’4 might need a different fit than someone who is 5’7. Our advice would be to look for pieces in line with whatever special sizing your figure is closest to. Most tall items are designed to shorten the figure and transform what can sometimes be a lanky silhouette. To do so, they employ horizontal stitching and patterns, while longer sleeves and hems ensure that no clothing items appear shrunken on the body. Do you shop for special sizing? Let us know why or why not in the comments!